A computerized function that allows you to place yourself on a Registration Waitlist when a class enrollment is full. If you are on a Waitlist and a space opens, you will be notified through your myCNM email. 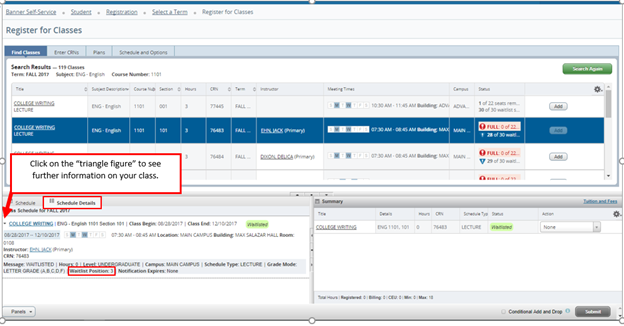 Or, you can check to see if the option "Register" is available, by clicking the drop down menu, under the Action column next to the class, from the Register for Classes screen. You will then be able to register for the class within the allotted time displayed on your email notification. Note: As a waitlisted student, you are strongly encouraged to check your myCNM email account daily. The waitlist system operates 24/7, including weekends and holidays. Do all classes have a Waitlist? No. Classes with special enrollment restrictions will not have waitlists. How will I know if a class has a Waitlist? What should I do if the class has a long Waitlist? Place yourself on the waitlist. Each academic school closely monitors the waitlists and will notify you if a new section can be opened. Update your cell number with us, we use texting as an additional method to contact you. How do I put myself on a Waitlist? I followed the instructions above and the computer won't let me put myself on a Waitlist. What happened? How will I know my position on the Waitlist? Once a seat becomes available, will I be registered for the class? If the student does not register for the class within the time allotted in the email notification, they will be removed from the Waitlist. The Waitlist system operates 24/7, including weekends and holidays. Also, you are responsible for dropping any unneeded Waitlisted courses that you are on. Why was my name removed from the Waitlist? Your Waitlist notification may have expired because you didn't register for the course within the time allotted in your myCNM email. Registration Waitlists will be turned off two days before every part of term begins in which the class is offered . This means a student will not be able to Waitlist a course for that part of term. How do I register for a class when I receive email notification that a space is available? 1. 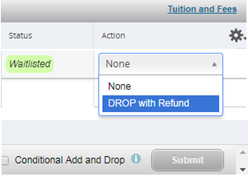 In Register for Classes, select the "Action" drop down under Summary. 2. Select “Register” and click “Submit” to save the changes. 3. The class status appears “Registered”. 4. In Register for Classes, select the "Action" drop down under Summary. 5. Select “Register” and click “Submit” to save the changes. 6. The class status appears “Registered”. 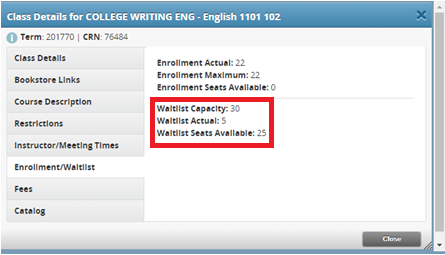 Can I be on a Waitlist for more than one section of the same class? Can I be on a Waitlist for a class that has a time conflict with another class that I am currently registered in? Yes. However, you will be unable to register for the course due to the time conflict. Can I be on a Waitlist for a class in which I have not met the pre-requisite, corequisite, or other registration restriction? No. Prerequisites, corequisites, and repeat limits will be checked. Once I register, am I done? As a courtesy to other waitlisted students, drop yourself from all unneeded waitlists. What if I am still on the Waitlist when the class starts? Registration Waitlists will be turned off two days before every part of term begins in which the class is offered. This means a student will not be able to Waitlist a course for that part of term.